Usually, ideas come to us when we give our minds space — while going for a long nature walk, while working out, while in the shower — they tend not to come to us while in a high intensity groupthink environment surrounded by peers, superiors and having been given just one hour to come up with ‘breakthrough’ ideas that will save the company from disruption. However, by bringing together the right people, creating the rightenvironment and using the right tools, we can drastically improve the outcomes of such initiatives. That’s where design thinking comes in — as it walks participants through proven pathways for inspiration, problem definition, idea generation, prototyping and testing. Globally, about 95% of startups fail and the number one reason is market failure — building what nobody knows exists, nobody wants to buy or nobody wants to pay more for than it costs you to get it in their hands. The agile developer got to work, focusing on high value features first. After just the third month and just $1.5M billed, the construction company terminated the contract because they had received the main value they desired. They paid out the remaining 20% ($1.7M) for a total of $3.2M of the $10M contract. The developer also won — their profit margin soared from a forecast 15% in the original contract to 60% and they now had 17 months free to bid, win and deliver other work in the same manner. 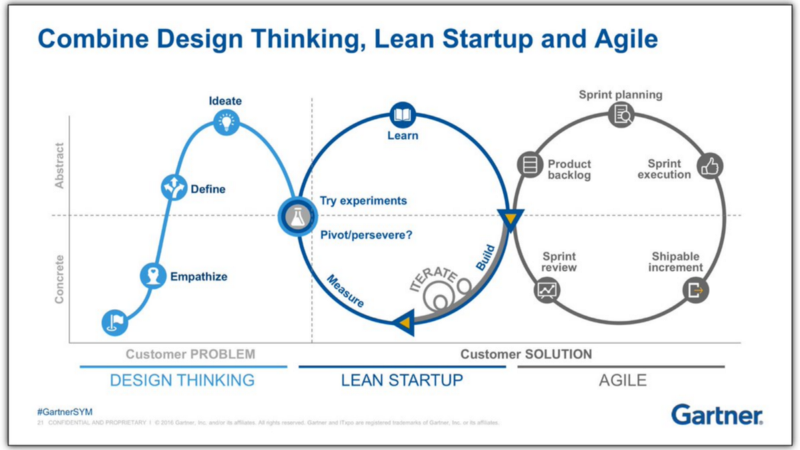 By combining design thinking, the lean startup and agile, you are far more likely to not only come up with better ideas but turn those ideas into viable money makers and deliver them in a way that creates immediate value for customers, doesn’t result in cost and schedule blowouts — synonymous with innovation at large companies — and give your employees the opportunity to partake in more rewarding and fulfilling work. This last point is key, all of these methods engage users in a frequent feedback loop so we can measure progress and adapt so that we are maximising value creation. This is at odds with the old way of over-planning and then and only then moving to doing, often for months or years on end (as is the case with digital transformation projects — which by the way fail 90% of the time), without feeling of accomplishment or completion until the very end of the project, where oftentimes — because of the inherent lack of feedback and unwaveringly sticking to a script — things come unstuck. Nobody wants to spend months or years delivering something that doesn’t create impact or deliver value.